A heavy, sweet and floral, green fragrance that is very complex with an exotic hint of spice & an absolute delight to smell - sensual & stunning. Frangipani is known as the Tree of Life in India, a branch cut from the tree will continue to blossom, as if representing our soul's infinite connection to the Divine. Frangipani was a favorite flower of Lord Krishna. Undiluted Frangipani Absolute. 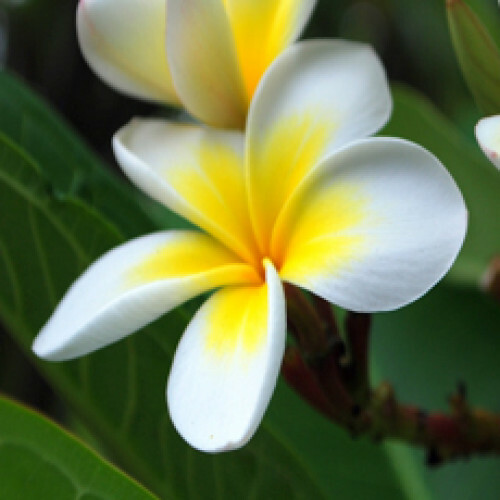 On a subtle/esoteric level, frangipani can make you feel very comfortable with yourself and give inner peace, self awareness and confidence. For this reason it is often used in terminal care although it should not be thought of in a morbid way at all. Frequently, it can release tension in a situation and make you laugh. Owing to its rich, exotic and sensual fragrance, it is widely used in high class perfumery. With its anti-inflammatory, antioxidant skin refreshing properties, it finds usage in night creams or lotions and other preventative preparations, as well as deep cleansing lotions.